In the earliest days of the medical profession, no device existed to measure a patient's body temperature. Evaluating a patients' body temperature depended totally on the doctor's personal methods of observation. It was not until the late sixteenth century that scientists devised an instrument able to detect changes in air temperature. It was many years later that a medical thennometer was constructed. The first thermometers were created to measure changes in air temperature. The most famous of these was invented by Galileo (1564-1642) in 1592. Called an air-thermoscope (or air thermometer), it consisted of a long glass tube with a wide bulb at one end. When the tube was first heated the air inside expanded and some of it was naturally expelled. While still warm, the open end of the tube was placed into a flask of water. As the tube cooled, the warm air contracted, drawing water into the tube. Once the tube-and-water system reached a state of balance, any change in air temperature would cause the level of the water within the tube to rise or fall. There were two major hindrances to the acceptance of the air-thermoscope. First, the varying sizes of the tubes made it very difficult to graduate the device and therefore establish a degree scale. Second, it was soon discovered that the air-thermoscope was unreliable. It gave widely varying readings for apparently identical temperatures. In the 1660s it was realized that the open-ended system would react to air pressure as well as temperature. This meant that the instrument per-formed as a barometer as well as an air thermometer. This realization came several years after a solution was found in 1654 by Duke Ferdinand II of Tuscany. The duke constructed a sealed liquid-in-glass thermometer that did not vary with changes in air pressure. Coupling this new thernometer with graduations devised in 1612 by Italian doctor Santorio Santorre, the device was complete. European scientists quickly began working to perfect the design of the thermometer. One of the issues addressed was the need for an instrument that could travel by sea. This was because ordinary liquid thermometers were rendered unreliable by a ship's rocking motions. In 1695 French physicist Guillaume Amontons designed a thermometer composed of a tube filled with compressed air and capped with a layer of mercury. As the temperature increased the air would expand, causing the mercury level to rise. Conversely, as the temperature decreased, the mercury would fall. Another Frenchman, Rene de Reaumur (1683-1757), sought to improve upon Amontons's design by replacing the air-and-mercury system with a mixture of alcohol and water. Reaumur's thermometer was remarkable in that he devised an 80-degree temperature scale based upon the freezing and boiling points of water. These were to be the same points that would become the basis for the more widely accepted scales of Celsius and Fahrenheit. At the turn of the eighteenth century the most important issue for scientists and instrument makers was the lack of a standard temperature scale. Because the level of glass-blowing technology was too poor to make identical thermometer tubes, every scientist's temperature scale was different. In 1717 a Dutch instrument maker Daniel Fahrenheit introduced a line of mercury-filled thermometers of nearly identical proportions. His use of mercury in very thin tubes allowed him to graduate the scale into many degrees. He used the boiling (212 degrees) and freezing (32 degrees) points of water as reference points. Fahrenheit developed the first scale to be accepted as a worldwide standard. The Fahrenheit scale enjoyed global popularity for many years, until the introduction of the 100-degree scale by Anders Celsius in 1746. Several scientists had attempted to popularize a 100-point scale, but Celsius was the first to also utilize water's freezing and boiling points as the 0-and 100-degree marks. Originally, Celsius placed the freezing point at 100 degrees and the boiling point at 0 degrees. This was reversed in 1747, at which time the centigrade (meaning "500 steps") scale began to increase in popularity. In 1946 the Celsius scale was adopted by most of the world as the official temperature scale. Probably the most familiar thermometer is that found in a doctor's office, or the "clinical thermometer." The clinical thermometer was invented in 1866 by Sir Thomas Clifford Allbutt, an English physician. The important features of this thermometer were that it was relatively short, usually no longer than six inches, and it responded quickly to the patient's temperature. Previous instruments required nearly 20 minutes to get an accurate reading, while Allbutt's thermometer could reach equilibrium in less than five minutes. This made it easier for doctors to follow the course of a fever, since temperatures could be taken more quickly and more often. 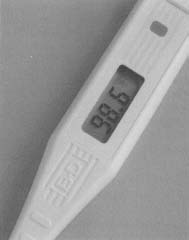 Modern thermometers come in many different varieties. New thermometers are being designed that can read a patient's temperature using infrared technology. These devices can determine a person's temperature in about one minute, and take the reading from inside the ear, rather than the mouth. It is a very useful informations...Thank you for posting this page...Saludar! What technologies were used to make the thermometer?